Some years ago, during a family dinner in the Macrae household in Lochs, a young upstart named Malky told his sister that Stornoway would thrash Golspie at golf. The Macraes have dual nationality in Lewis and Golspie and, from that little argument, the inter-club matches between Golspie and Stornoway golf clubs evolved. 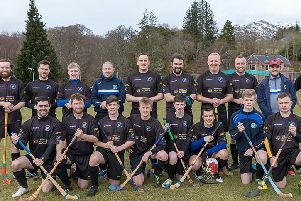 The clubs now play twice each year; last Saturday saw the visit of the Golspie team to the Hebrides. Alternating between biting wind with hail showers and strong sunshine, the conditions proved challenging for both teams. The result, a draw, was probably less important than the game but it sets up an exciting finale to the season when Stornoway comes to Golspie in mid-September. These occasions are as much social as sporting gatherings. The fact that, when the ferry docked in Stornoway, the safe arrival of Jimmy Yuill’s guitar seemed to of more importance than all the golfing paraphernalia being unloaded, tells its own story. In much the same vein, the safe arrival of John Fraser’s vocal cords always seems to be of paramount importance when the Stornoway golf team visits Golspie. By coincidence, the patriarch of the Macrae family, Robbie, made headlines in the first competition of the summer season. Playing in the opening qualifying round for the Centenary Medal, Robbie followed a steady outward half by making par at six of the nine remaining holes. His gross 79 was embarrassingly close to his age. The 39 stableford points amassed by Robbie were not quite enough to win on the day, although they did result in a cut of two strokes to his handicap. In third spot, two points adrift, was Alasdair Gillies, whose solid round was marred by the inexplicable and punishing loss of a ball just off the Glen fairway. The winner also had 39 stableford points. Donald “Sweeney” Macsween continued his form from the last days of Winter League and his finish of two over par on the final six holes proved to be impossible to beat. Last weekend was also the first qualifying round for the Jackson Medal. Despite the inter-club match later on the same day, almost forty competitors made an early start in strong winds. The scoring was unsurprisingly high and consequently, as in midweek, the competition scratch score rose to 70. Alasdair Gillies was again to the fore, a birdie on the Redan being the highlight of his nett 70 although it was a strong finish of two over par on the last six holes that lifted him into fourth position. Magnus Johnson also posted nett 70 and took third place courtesy of an impressive inward half of only three over par. Eddie Rogers took the plaudits for the lowest gross score of the day but his nett 68 was not quite enough for victory. After a comparatively ordinary first half, Eddie appeared to be on the slide after dropping five shots in the following three holes. However, that simply proved to be the springboard for a superb finish, which included an eagle on the Caberfeidh, a birdie on the Cup and three pars. The winning score was the nett 67 set by David Gray. David may have made an early birdie on the Ard Choille but is was his strong performance in the latter part of the outward and inward halves that was the key to his win. From a personal point of view, the opening days of the season were a mixed bag. On the bright side, the course is almost unrecognisable from a fortnight ago. The greens are vastly improved, while a drying wind and a little warmth is encouraging growth and colour. The downside is that I have already lost more balls than over the entire winter. The main reason for that is that, when I hit an awful shot, which is quite a lot of the time, I close my eyes and grimace in frustration. That makes it impossible to spot the general area of heather in which the ball has landed. The search is more difficult when your playing partners have also grimaced and looked away. What little confidence remained was momentarily boosted by selection to play in the inter-club match. For Golspie, it emerged. Every sports afficionado knows that being offered to the opposition is about as low as things can go.